On May 21st 1987, 22 young social workers, lawyers, businessmen, theatre practitioners and other professionals were detained without trial under the internal security law and accused of “being members of a dangerous Marxist conspiracy bent on subverting the PAP ruled government by force, and replacing it with a Marxist state.” A second wave of arrests took place on June 20th the same year. The detainees were forced to make false confessions by the way of mental and physical torture. They were subjected to harsh and intensive interrogations, deprived of sleep and rest, some for as long as 70 hours in freezing cold rooms. All of them were stripped of their personal clothings, including spectacles, footwear and underwear and were made to change into prisoners’ uniforms. 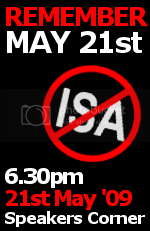 On 21st May 2009, which marks the 22nd anniversary of ‘Operation Spectrum’, a group of concerned Singaporeans will be demonstrating against the treatment of the detainees who were detained without trial under the ISA. You are invited to come to Speakers Corner and remember this day with us.